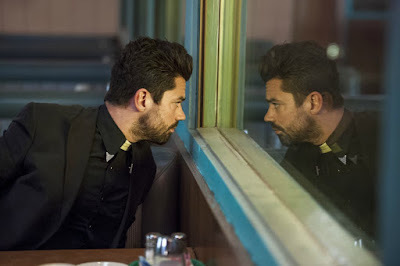 Last week on Preacher, we were left wondering how long Jesse could remain on the side of angels with his new found power. The more he learns about his power, the more it gets to his head and the more there is potential for him to cross over to the dark side. Of course, he’s doing what he thinks is right, but as Eugene states, it’s cheating. Boy did Eugene find out the hard way what happens when you try to call Jesse in on his nonsense. Last week the angels Deblanc and Fiore confronted Jesse about the need to return ‘It” to them. This week, we are not only treated to and understanding of what “it” is, but we are finally given a name. Through this exposition, “it” finally gets a name. The love triangle plot develops even further. We are treated to a kickass angel fight and got, even more, development for Poor Eugene “Arseface” Root. The episode continued from last week in the diner where Deblanc and Fiore confronted Jesse last week about needing him to relinquish the power. We are finally treated to a bit of exposition surrounding Jesse’s power and the celestial importance of it. Turns out as they said last week, Jesse doesn’t have the power of God. So does that mean he has the power of Hell or The Devil? Well, not exactly. Turns out it’s the best of both worlds. The union of an angel and a demon has created “an abomination” that the two angels have called “Genesis” after the first book of the bible. The two angels explain that this “baby” is problematic for both Heaven and Hell if words get out that it is down to earth. The two custodians broke protocol and went to Earth under the radar to try and retrieve it back. Jesse in his arrogance doesn’t want to give it up. He still thinks that is it something that God chose to give to him, and he’s not letting it go. The two angels notice a new person in the mix, a normal suburban housewife. Whoever she is, confronting her is more important than confronting Jesse about Genesis. Within a minute of talking to the housewife, they are already beating the crap out of her. 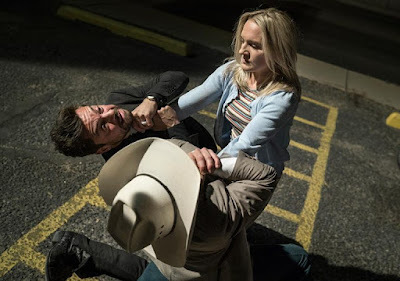 This leads Jesse to intervene thinking they are just beating up some poor woman. There we are treated to the first visual of the angel resurrection process. The two angels kill the woman and immediately off-screen we see a blinding light, and she’s back. Turns out she’s another angel that has been sent to bring the two back to Heaven since they are fugitives. Deblanc and Fiore warn Jesse that although they are after them, if she finds out about Genesis, then the floodgates will open and everyone from both Heaven and Hell will try and claim the power for their own. It’s time to leave from the diner! The two angels and Jesse escape the diner with the angel Seraphim hot on their trail. As they try to regroup back at the hotel, she tracks them back there and all mayhem happens. We are treated to a battle royal between Deblanc, Fiore, Jesse, and Seraphim. Every single time one of the angels dies, they immediately are resurrected and the fight continues. The scene is part gruesome, part hilarious as the bodies continue piling up of the three angels during the battle. They have to find a way to subdue Seraphim because if they kill her, she’ll just come back to life and continue the fight. Jesse accidently kills her, as do Deblanc and Fiore. To make matters worse, Cassidy shows up and puts her down a few times as well. When Seraphim is finally put down without killing, Jesse and Cassidy then leave and head back to the church. Jesse states to the angels that he will be keeping Genesis. As they try to confront Jesse, he uses the power on them. Turns out Jesse if even more powerful than the angels as well, which will surely create problems down the line. At the church, Jesse and Cassidy talk about what happened and Cassidy even tries to talk some sense into him, but Jesse’s now really full of himself. They do manage to have a great “Pulp Fiction” scene as the two sit and chat in their underwear. As they are washing the blood out of their clothes, they discuss their tattoos where Jesse reveals his Tulip tattoo. Although Cassidy doesn’t realize it at the time, he puts two and two together and realizes that they are in love with the same woman which leads to an awkward confrontation later on when Tulip shows up at the church. Speaking of Tulip, she goes on one of her Tulip rampages as Lucy’s house. Lucy is simply taking care of her sick daughter when Tulip barges into her house in a jealous rage telling her to stay away from her boyfriend. 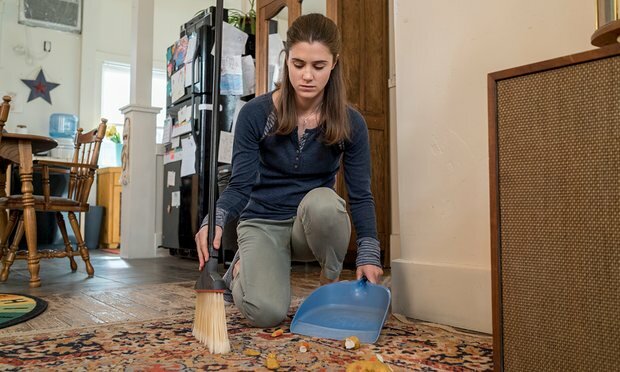 After breaking Lucy’s daughter’s art project, she calms down and tries to make amends by doing “church work” for her so she can take care of her sick daughter. This leads Tulip and Lucy to have a heart to heart and make peace with each other. As Tulip heads to the church, she and Cassidy are almost caught in a compromising position, but she and Cassidy manage to evade detection. Elsewhere, Eugene is making friends. 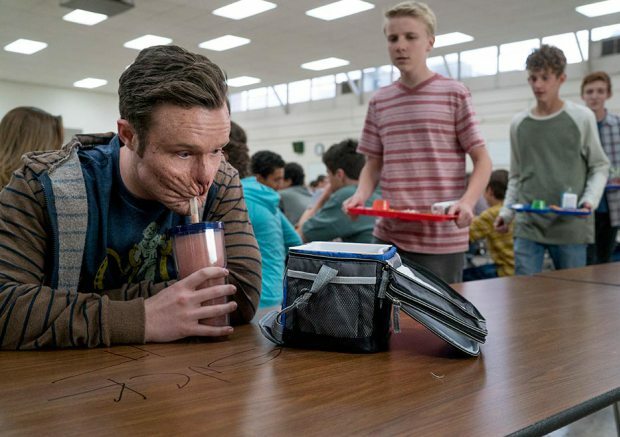 As a result of Jesse using his power to make people in the town to see him in a new light, some kids at the school are being kind to him. This is something Eugene is not used to, so it makes him feel a little uneasy. The kids invite him to an impromptu fireworks celebration (Happy 4th of July BTW), and he’s finally accepted. This is something that Eugene has always wanted, but he feels hollow because he knows that it’s because of something that Jesse did and not something he earned himself. Eugene goes to the church to speak with Jesse about wanting him to take it away. This is where Jesse goes from neutral to Anakin Skywalker. Jesse is pissed that Eugene is not appreciating what he has done for him. When Eugene says that people shouldn’t be forced to change, but should be able to choose, he says to Jesse that he’s “cheating,” which is the cold hard truth that he’s not ready to hear. Jesse in a pit of rage tells Eugene to “go to hell” and that’s exactly what happens. Poor Eugene disappears from the church for parts unknown. With Game of Thrones’ season over, Preacher turned up the volume and made its best episode to date. It’s almost like they now know they don’t have any real Sunday competition, so they are swinging for the fences now and it really improved the show. We got some strong character development for everyone all around. With Jesse learning the truth about Heaven, Hell, and Genesis he’s starting to branch out and do what he wants. Many characters are now existing in a gray world. The only person who’s remaining true to themselves in poor Eugene who you can’t help but feel sorry for. Hopefully, Eugene will not remain in Hell too long.